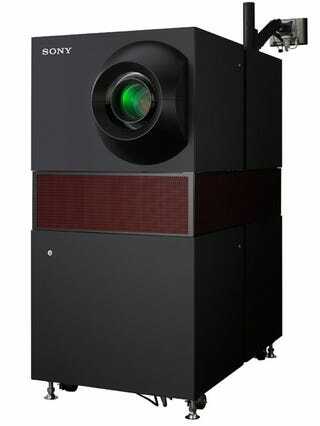 Witness the obliterating power and sheer magnificence of the new Sony CineAlta 4K SRX-R220, the projector that can display 8.850.000 pixels of ultra high definition footage in movie theaters, crazy rich people's home theaters and probably be integrated as deathly weaponry in any space battle station. This technological terror is the latest iteration of Sony's SXRD (Silicon X-tal Reflective Display) line. Like the SRX-R1xx series it still can't reach 10 megapixels, but it comes loaded with more gear than the Death Star itself: LMT-100 media processor, LMS-100 screen management system, a gazillion gigabytes of RAID storage and uninterruptible power supply are all built-in. More photos, so you can see the scale of the SRX-R210/R220, full specs, price and availability after the jump. The projector itself has 4096 x 2160 pixels resolution with a 2000:1 contrast and 14 foot Lambert brightness (a whooping 47,964 cd/m2, according to Sony's site). The SRX-R220 model can fully cover a 20 meter screen (65.6 feet) with its 4.2W xenon lamp while the R110 goes up to 17 meters with a 3.0W and 14 meters with a 2.0W lamp. The LMT-100 media processor (or Media Block, as Sony calls it) is in charge of pushing all those pixels to the screen, upscaling in case the original material is lower resolution, decrypting the content so no kids can put a couple of terabytes of UltraHD material on BitTorrent, process the multi-channel audio and even place subtitles on the fly using XML or PNG files. Beyond connecting all kinds of video gear using BNC connectors you can also connect a computer, PlayStation 3 or AppleTV using a DVI port. You know, just for fun. The SRX-R220 and SRX-R210 has prices starting at $126,540, pop-corn machine and Golden Flavor dispenser not included. Expect to see it in a theater near you at the end of 2007 or 2008, because it will be available for sale from May 2007.